XTB will perform a special Finnish-themed concert, including such fine pieces as Finnish Rhapsody by Clare Grundman, Celebration for Wind Orchestra by Jukka Viitasaari, and Finlandia by Jean Sibelius. 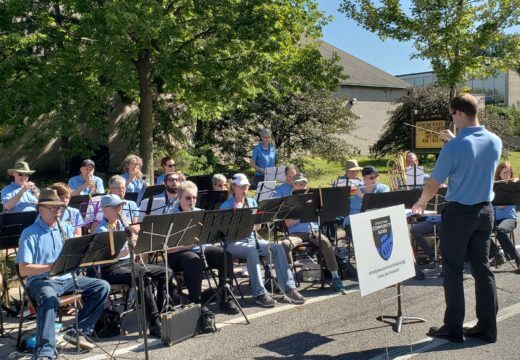 XTB is a true “community” band made up of local musicians who bring music to nearby neighborhoods and community. They come from a variety of backgrounds and interests, and this is reflected in the broad range of musical genres and styles they enjoy playing. The band performs frequently through the year – holiday concerts, free theme-oriented summer concerts in the Minneapolis public parks, at the MN Landscape Arboretum, at the Mall of America, and concerts serving specific group’s heritage such as the traditional and contemporary pieces they performed for FinnFest 2017 at Orchestra Hall and Norwegian music at the Mindekirken Church. They have commissioned a local composer Gideon Matchey to write a composition for premier at their Spring 2019 concerts, and we will enjoy a first-ever performance at the March FACA program! XTB had its first rehearsal in June, 2011. Today the fun, informal group has 30 members and looks to grow. The band is directed by Preston Weber. For more information see XTB@crosstowncommunityband.org! Coffee and conversation will follow our program. Events listed on finnsource.org are courtesy of FinnSource, a non-profit volunteer organization. FinnSource is not responsible for inaccurate information for non-FinnSource events. © 2019 FinnSource | Designed by Moorhead & Co.